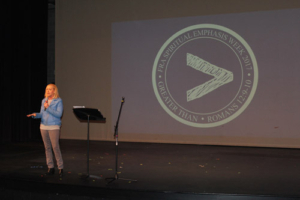 Last week, Mercy Multiplied was given the honor of serving in a dual role in the Franklin Road Academy (FRA) “Spiritual Emphasis Week”. 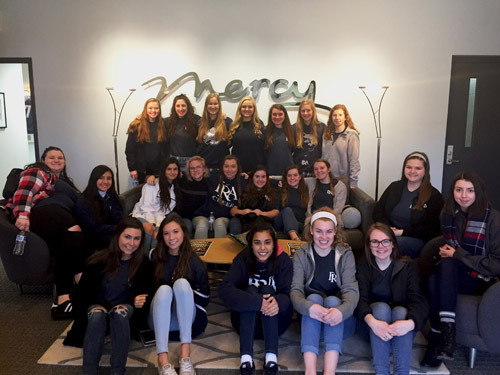 On Wednesday, Mercy Founder and President, Nancy Alcorn, shared a special message with 7th-12th grade students surrounding the week’s theme “Greater Than.” Then on Friday, 25 girls from FRA’s junior class spent the morning doing service projects at the Nashville Mercy home and corporate offices. During her presentation to students at FRA, Nancy shared her personal story of starting Mercy Multiplied. She credited the expansion and success of the work Mercy Multiplied has been doing for 34 years to the fact that God is “greater than” our own abilities and dreams. 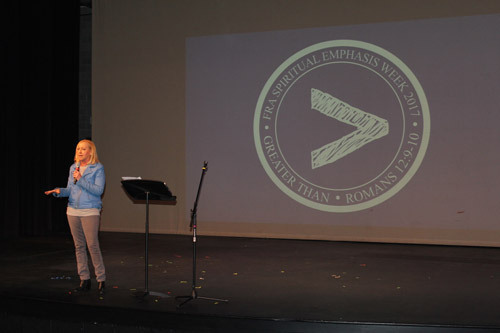 Nancy encouraged students to filter every issue they were facing through the lens of God, stating, “I don’t know what type of issues you’re facing today, but God is greater.” She further encouraged them to place their dreams before God, imploring them that apart from Him, they could accomplish nothing, but connected with Him, they could accomplish things greater than they ever dreamed. After Nancy finished sharing with the students, Brandon Albright, FRA Director of Spiritual Life, prayed over Mercy Multiplied and Nancy. Students were then given the opportunity to receive free Mercy resources for themselves or for friends. Many students took the Mercy For Series. 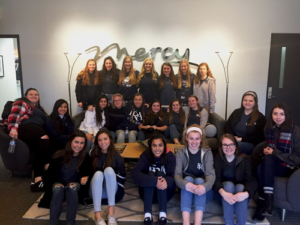 After gaining a clear understanding and vision of Mercy Multiplied through Nancy’s teaching, the 25 student volunteers from FRA were so excited to take part in a service project to benefit Mercy! To begin, Mercy staff gave the volunteers a tour of the Nashville Mercy home. They then split up to serve in various areas. One group worked alongside Mercy staff to organize the basement storage area and the home library. Another group helped staff organize Mercy’s “Blessing Closet” full of clothes and jewelry that residents can choose items from while living in the Nashville Mercy home. Another group helped our IT Team in the classroom, organizing computers and checking software. The students also had a short visit with several of the Mercy residents and took part in a Q & A session about the Mercy program. The students’ help was immensely appreciated, and Mercy was honored to host them. Several FRA volunteers stated how much they loved serving Mercy Multiplied in this capacity and were excited to return for a visit at a later date. 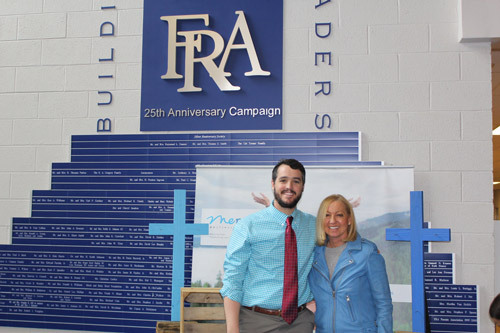 Mercy is grateful for such amazing opportunities to partner with schools like FRA! To learn more about volunteering or partnering with Mercy Multiplied, visit our website.